Could You Have a Spinal Fracture…and Not Know It? Did you know that you can get a spinal fracture from simply stepping off a curb, sneezing, lifting a small pet or even just getting out of bed? Fractures due to osteoporosis are much more common than many people realize. In fact, after age 50, one in two women and one in five men will have an osteoporosis–related fracture in their lifetimes. The most common type of fracture linked to osteoporosis is a vertebral compression fracture (VCF)—a break in a vertebra of the spine. VCFs are more common than hip or wrist fractures…often are painful…and can lead to loss of height and a stooped back. So why do a shocking two-thirds of VCFs go undiagnosed and untreated? Osteoporosis can weaken the bones so much that even routine activities or seemingly innocuous movements can cause a spinal fracture. Sudden, nonradiating pain ranging from mild to severe is typically the first sign. But the pain is often mistaken for arthritis or a pinched nerve. And because many people with osteoporosis don’t even know they have it, VCFs simply aren’t on their radar. An undiagnosed VCF will often heal on its own, with the pain diminishing in six to eight weeks. But you don’t want this fracture to go undiagnosed! One VCF increases the risk for a subsequent VCF fivefold. And multiple fractures result in a loss of height and stooped posture. With each additional untreated VCF, the spine can get a few millimeters shorter. If the vertebrae in the upper back fracture and become wedge-shaped, the spine curves abnormally causing kyphosis, a rounding of the back better known as a dowager’s hump. 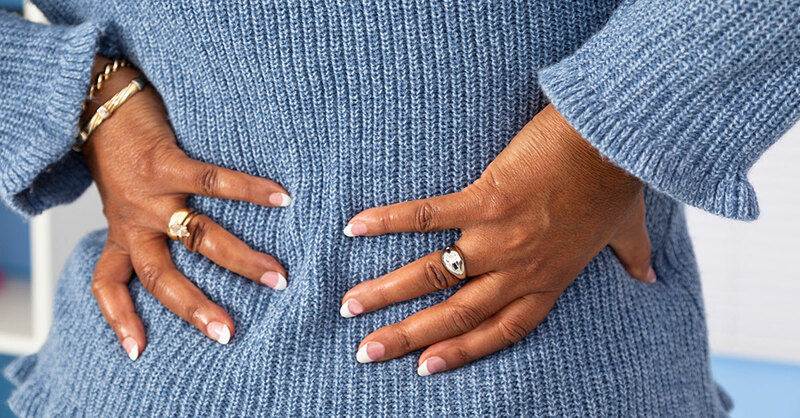 If you’re a woman or man over age 50 or a postmenopausal woman under age 50 who is experiencing new, unexplained mild-to-severe midline back pain that doesn’t go away in a day or two, you need to see a doctor. Your primary care physician will perform a physical exam to check for back tenderness and will likely order an X-ray to confirm the diagnosis, following up with a CT scan or MRI to evaluate the problem further. Your doctor will then advise you on the best treatment for your specific situation. • A few days of bed rest. VCF pain tends to worsen when sitting or standing and improves when lying down. • Pain relievers. Over-the-counter pain relievers, such as ibuprofen (Advil) or acetaminophen (Tylenol), help reduce mild pain. • A hyperextension back brace. Wearing a rigid hyperextension back brace for a few weeks can help relieve pain and improve function in some patients. Ask your doctor for guidance. • Physical therapy (PT). PT helps strengthen back muscles and can improve posture and prevent the development of chronic pain. It also has a beneficial effect on bone mineral density in osteoporosis patients and may prevent future fractures. Note: PT can be started once the patient’s pain is under control. Conservative treatment of a VCF is not recommended for more than a few weeks or for those with more severe pain or limited function. Prolonged bed rest may lead to loss of bone mass (up to 1% loss each week) and muscle strength (10% to 15% loss each week). Bed rest can also increase risk for blood clots and bed sores, and painkillers should only be used short term. Patients whose pain doesn’t resolve in two to three weeks with the treatments above may be candidates for a minimally invasive procedure called vertebroplasty. Guided by computed tomography and/or fluoroscopy (a continuous X-ray “movie”), the doctor injects bone cement into the fracture. The outpatient procedure takes about 45 minutes while the patient is typically conscious but sedated. The cement not only stabilizes the fractured vertebra, it also prevents nearby nerve endings from causing pain. Studies show that 75% to 100% of patients enjoy good-to-moderate pain relief and increased mobility quickly after vertebroplasty, often the next day. The procedure usually doesn’t restore much height loss, but it can prevent further height loss and additional fractures. With kyphoplasty, a modification of vertebroplasty, a balloon is inflated in the fractured vertebra to create a cavity that is then filled with cement. This procedure may offer a better chance of restoring height loss. However, kyphoplasty is more expensive than vertebroplasty, and there is mixed data on its benefit over vertebroplasty. In general, vertebroplasty and kyphoplasty are safe when done by an experienced doctor. Interventional radiologists and neuroradiologists often do these procedures. Look for a doctor who has experience in using image guidance for spine procedures. Like all invasive medical procedures, these treatments do have risks—such as infection or bleeding. And in rare cases, the cement can leak into the spinal canal, causing nerve compression, or travel into adjacent veins, which can lead to blood clots in the lungs or heart. The best candidates for these procedures are patients who have pain of at least moderate intensity (rated a five or greater out of 10) that impacts their mobility and daily quality of life. Additionally, those who have fractures that have occurred recently (within a few months prior to the procedure) tend to have more success with vertebroplasty and kyphoplasty than those who have older fractures. The age of a fracture can be determined by an MRI. Treating the underlying osteoporosis to help prevent future fractures is crucial. Ask your doctor for a bone mineral density test called a DXA (or DEXA)—this low-dose X-ray measures bone density in the hip and spine and can guide your physician in choosing the best course of action for your case. Options include prescription medications such as bisphosphonates (patients should weigh the risks versus benefits of these drugs with their doctors)…calcium and vitamin D supplementation…and weight-bearing exercise to improve bone strength and other exercises to build core strength. Multiple clinical trials have shown that early treatment of osteoporosis can increase bone mineral density by 5% to 15%, reducing vertebral fracture rates by 40% to 70%.